Looking at the final results - considering we had 4 pub quizzes, bonus points and a day of drinking - it was very close indeed with only 10 points separating the top 7 teams! In order to calculate the totals here I have added up the points total from Sir James's Faktory Quiz, Captain Stu's Gallus Quiz, Quizmaster Scott's Glasgow Pub Quiz, Quizguy Martin's Dukes Bonus Round and my Rockus Mega Music Mash-up. A big thanks to all the quiz teams, quizmasters, venues and folk in the pubs we pissed off on way around. Everyone who I spoke to had a great time, so plans will soon get underway for some similar fun next year. ...and assuming I find my camera there will be photographic evidence of some of the fun we had to follow! Full details for the ticketed winter quiz special to be announced soon. It's Glasgow's first ever Pub Quiz Pub Crawl! 4 different Venues all with their own unique pub quiz, all in one afternoon - along the way £100 of prizes to be won. 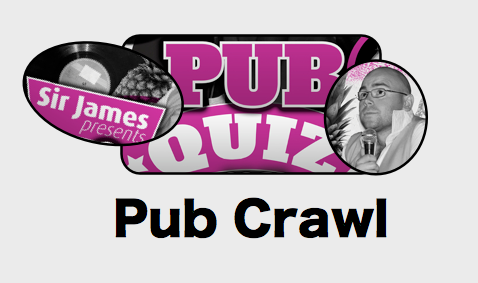 ... plus the chance to win £100 of Prizes and the 2013 Pub Quiz Pub Crawl Trophy! Max team size is 6. Tickets are available from Sir James at his weekly Pub Quizzes and in the Online Shop. ...finishing around 6pm in Rockus!